If you're trying to keep track of your stuff, from keys to the remote control, there's a world of tracking devices available to locate just about anything from your smartphone. Among them, Tile was already one of the smallest: a small, flat square that weighed only 1.3 ounces. But today the company has announced even smaller Tile Slim, which takes the title as the world's smallest Bluetooth tracking device. As the name implies, Slim is a slimmer version of the original Tile ($24.99 on Amazon), measuring just 2.4mm thick—about the thickness of two credit cards stacked together—to the original's 5.3mm. The thinness of the device means it's a bigger than the original, too, a 54mm square instead of a 37mm square, but you certainly couldn't call it bulky. The flat shape means the Tile Slim fits neatly inside wallets or stuck to the back of phones, remotes and other electronics without adding noticeable bulk. There’s no hole, so you’ll still want the original Tile for your keychain. Beyond the size change, Tile Slim works much as the original Tile does. The tracker connects to your phone via Bluetooth and the Tile app (for iPhone and Android) can tell you the last place your Tile was seen and point you in the right direction when you're in Bluetooth range (up to 100 feet). You can use the mobile app to make your Tile ring (at 82dB, the Slim is a little quieter than the original, but it still makes plenty of noise) or press the Tile to make your phone ring (even if it's on silent). However, if you're out of Bluetooth range and your item's last known location isn't helping, you can tap into Tile's community of users to locate your device, with every Tile app keeping a lookout for your item (securely and anonymously, of course). 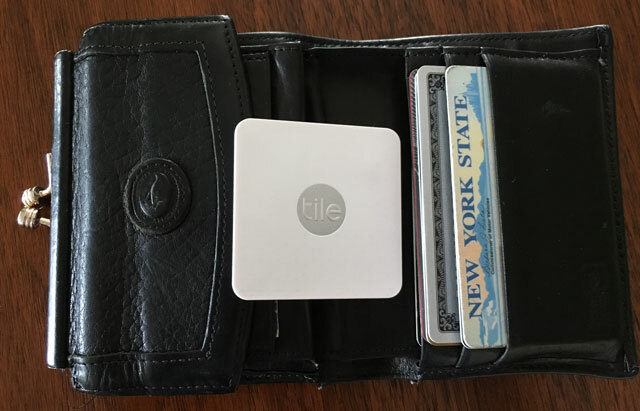 In short, it's a great way to find just about anything you might misplace, and Tile claims the device helps people find a half million items every day. If there's a downside to Tile, it's the cost. Tile Slim costs $30 each ($5 more than the original Tile) or $100 for a 4-pack ($30 more than the original), which puts it on the high end of the price range for similar devices. While $30 won't break the bank, it's enough to prevent you from attaching Tile to everything in your household. On top of the price tag, Tile's non-replaceable battery is only guaranteed to last for a year, after which point you'll need to buy another Tile—though the company offers discounts of up to 50% for repeat buyers. Still, it's a good buy—and will save a lot of frustration—for keys, wallets and other must-have items that might be easily misplaced. Tile Slim will be available from major retailers—including Walmart, Best Buy, Target, Apple, Lowes, AT&T, T-Mobile, Verizon and more—starting September 2.